*Actually not. The AddOn is pretty indifferent towards humans. Don't take it personal. If you are here because ESO told you that the AddOn can't load due to missing dependencies, please check here. Responsive developer Found something that's not in the catalogue? Tell me where you got it, send me an item link, and in it goes! Preview: I can't let you preview things from Furniture Catalogue. Scroll down for the long explanation. Crown Store: I can't access Crown Store tooltips. If you have a crown store item, please send me the link and price! Why should I use this instead of CraftStore? You probably shouldn't - this AddOn has a different purpose. I wrote FurnitureCatalogue to help me with furnishing my homes - I wanted to know what's out there and how I can get it. By careful estimate I've spent 30+ hours on FurC since Morrowind hit PTS - the initial release ate a week of vacation turned to pretty much nonstop coding. If you want to give back, feel free to donate to @manavortex, both on EU and US! My crafter's knowledge isn't correct! Just click the refresh button. If you want the AddOn to scan on every load, there is a setting "inable initial scan" - check if it's deactivated. This only shows Pact PVP furniture, and I'm $other_faction! This is a feature. Adding complexity adds bugs and loading times - and that's needlessly complex, since the prices and item sources are the same. Wipe the saved variables - you can do that from the AddOn menu via "Reset to default". What do I have to do when I want to reproduce this bug? Big thanks to my fellow developers for being so awesome and helping me out so much! I have talked to Chip Hilseberg (may his code never bug) about this, and he was quite clear - ZOS doesn't want us to preview items from the item links because of datamining etc. A function to preview items that we can craft may come eventually, but that will only help you while logged in on your crafter. Why can't you make it work like FurniturePreview? There is an API function that lets you preview something that is in a bag (a vendor is a bag too) or a guild store. In theory I could add preview functions from Furniture Catalogue for items that are in your inventory, but that would require yet another loop and have a negative impact on performance. (Again.) Just use FurniturePreview for those, please. - if you don't find change notes, it's because it's Luxury Furnisher. Booooring. - UI now has a button that lets you toggle display of rumour recipes on the fly. - Set up everything for Wrath of the Dungeons. New items are currently all classified as rumour items, and won't show up if you're not on PTS. - Additional item sources from Ziggr, thanks! - Changed lib inclusion to standalone install, ship them standalone instead of bundled for now. Will not update included libs and will remove them in the future. 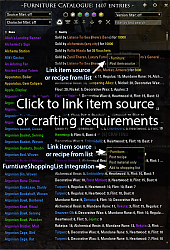 - Added a metric ****ton of previously uncategorized recipes - they'Re now either crown store or rumour items. I categorized them all. By. Hand. Over several hours. In case you want to pour gold my way, I won't say no, I probably need it to buy OCD therapy. - Added a few missing item sources after logging on NA. Thanks to my NA users - I appreciate your mails, even if I let them time out, they do get read. - Included Wolfhunter stuff - only visible on PTS right now. - Added a divider to the context menu. You can disable it in settings. - Patched up the achievements for the capital vendor - some of those had the wrong IDs. - Updated LibCustomTitles. Yes, this AddOn bundles LibCustomTitles. If you have a problem with that, you are very welcome to go and write your own. - Mapped a gazillion of items to their crown store prices. After seeing those crown store prices, I've come to the conclusion that whoever is in charge of those things is either Croesus, a Ferengi, or actively trying to drive Housing enthusiasts away from the game. - Exception fix. Forgot a file in the commit. - More love for the dev utility. That will save me a crapton of work. - Added a FurnitureCatalogue_DevUtility-sub-AddOn. It won't even try to load if you're not me, so feel free to ignore it. - Added 100023.lua with PTS data. Haven't gotten around to include the furniture on Artaeum yet. - Added a bunch of items. Finally got around to including all the paintings. - Fixed rumour dropdown entry, it's working now, at least if you don't hide any dropdown entries via settings. If you do, there might still be errors. - Corrected a few database entries. ZOS are sneaky fetchers with their furniture! - Set up git for FurC! Excite! - Went over the luxury furnisher files again, added everything that was missing and added a date string. You can now see in the tooltip/source _when_ the fetcher had an item. The date is currently not formatted. - Added an item source for human skulls. Opposed to common sense, those can be stolen from any species, not only humans. - Now additional AddOn with dependency in the same folder: FurnitureCatalogue_Export. Feel free to test it and tell me if it works/if you need anything else added to it. - Export-button removed - it was broken anyway. In one of the next updates there'll be FurnitureCatalogue_Export, with own saved variables, just for you. - The tooltip from the dropdown menus will now correctly disappear after selecting something. - Three weeks of Luxury Furnisher. Sorry - this took longer than expected, and then we moved. - Completely overhauled the saved variables and the way the AddOn handles data. It's far, far faster now! 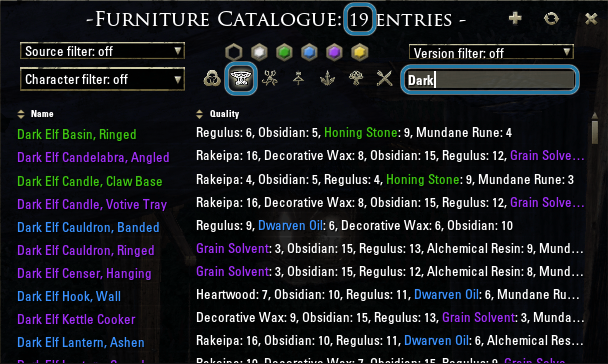 - Fixed the filters for the different crafting stations. Did you know they were broken the whole time? I sure did not. - Saw a Hlaalu Well in guild stores and briefly pondered including it, but the only way to get it is to purchase Amaya Lake Lodge via crowns, so I consider that an edge case. - Made the AddOn Clockwork-ready! - Altered the search - it will now consider item sources on store-bought items, so that if you search for "Hew's Bane" you will find items that are sold in HB or have it as part of their names. - The line height will now dynamically react to the font size. That way, you can list more entries, if you want. - Fixed the filters. Oops! - Added several Coldharbour plant drops - praise Azurah! - Now there's a menu button "Re-scan rumour recipes" to update the item sources in a different way than wiping the whole database. - Another week, another luxury furnisher! - Implemented "Favorites". Given that the dropdown box is broken for some reason, set "Source"-default to "Favorites" via /script FurC.SetDefaultDropdownChoice("Source", FurC.SourceIndices.favorites). - Dropdown: added another filter for luxury items. It can be merged with the Purchaseable (gold) filter in the settings. - Gave the settings menu some love. You will now be able to control the AddOn's behavior and interface far better. - You can now set multiple quality and crafting type filters. Clicking on the leftmost button will reset all filters of those type. - Made the behavior concerning rumour recipes more clear. - now wit an initial scan upon login, thanks to votan, completely lag-free! - Fixed the cursor thingy, again. - Added a new filtering option for "other", which includes items that can be acquired by (you might have guessed) other means than crafting and buying. THESE ITEMS HAVE TO BE MAINTAINED BY HAND, so feel free to send me item links and tell me where you got the stuff! - AddOn now adds icons to known and unknown furnishing blueprints in the inventory, bank and guild bank. Thanks to Dryzler! - No, not in the Guild Store, get AwesomeGuildStore, you lazy s'wit! - Added that light to Listens-To-Sea's Eastmarch data. - Added some performance tweaks. I hope the lag when switching to all the items is less noticeable now? Not gone though. Still not gone. Too much data. - Using a filter should cause the ScrollList to reset. Should. - FurC now has a donation button! Yay! - The UI will now remember its size and position. The feature was in all the time, I just forgot to hook it up. - fixed the dropdowns again! - verified that all three dropdowns work (they do! Turn on debug output if you need to be reassured. :)) Applied some cable binders to the back-end. - The GUI now has dropdowns instead of buttons, and the dropdowns work together. Yay! - I had broken the Furniture Shopping List integration! Fixed Furniture Shopping List integration. - your characters will not only be scanned, the scanned data will even be remembered! Yay! - Adjusted the dropdown knowledge: Known and unknown are now buttons on the interface, the dropdown instead filters "All", "Homestead" and "Morrowind". The Morrowind filter doesn't do anything yet, but will probably become crucial in about five weeks. - Not entirely sure if I have broken the Furniture Shopping List integration? I think I have. Will investigate later. - The furniture catalogue UI will now trigger the cursor mode when being opened and remove it when being closed in hudui mode. -- What did you do when you noticed it, how can I reproduce it? - You can now re-scan or wipe the database from the GUI. If you're going to wipe, there's even a nifty popup asking you, courtesy by sirinsidiator, who is awesome. All my fellow devs are awesome. - Added "seen in guild store" as source to items that you... you can probably figure. - votan gave me a hand fixing the tooltips. I think they might even be fixed now! 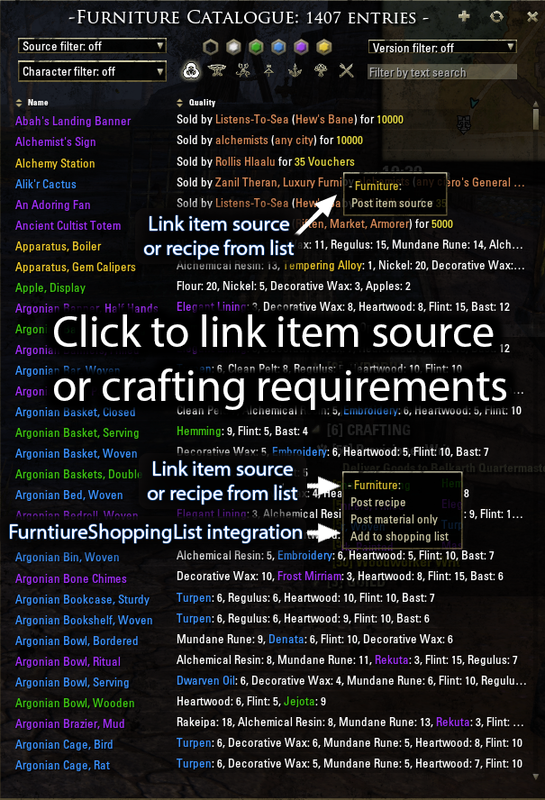 - AddOn authors: I added a global function AddFurnitureShoppingListMenuEntry(itemLink, calledFromFurC) for you - just add an item link to add another "Add to shopping list"-entry to your control's right click menu. Does not contain any checks, so use at own risk. - Fixed the tooltips. You sick of it yet? - Fixed the double tooltip issue. Again. - Items without a recipe will now have "print item source"
- Removed "purchasable" from dropdown menu - there are the toggles. Considering toggle for known/unknown too. - Added comments to some of the recipes (like the infamous Dunmer trestle) stating that while the recipe exists, it has not been dropping. Also added an option to exclude these items and set it to true by default. 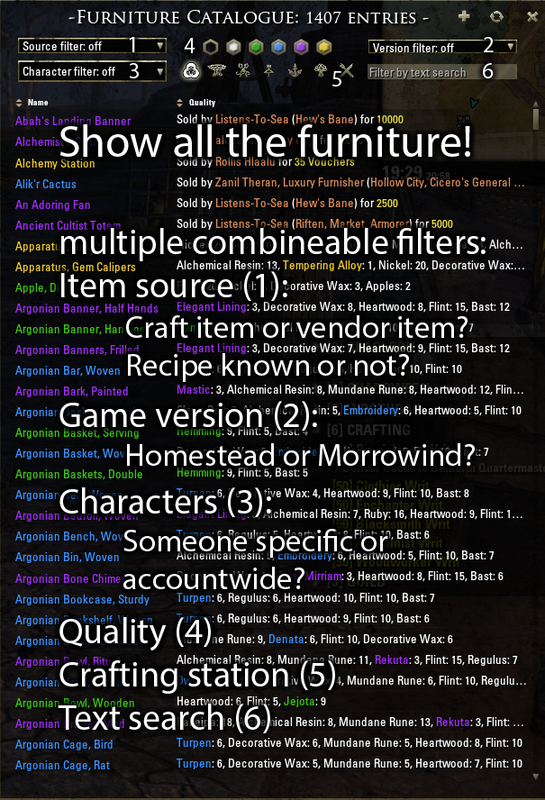 - Displaying the achievement required to purchase furnishing items from a vendor, if I have logged it yet. I need to gather all of those by hand unfortunately, so completing that list will take a while. Reduced the lag when opening the list or switching filters by about 1000%, please leave feedback if it's still noticeable. - Quality button textures ruthlessly stolen from, erm, strongly inspired by, Awesome GuildStore, which is awesome. - Furniture Catalogue now supports Furniture Shopping List! To take effect, wait for Noobanidus to push an update, or find "local function FurnitureShoppingListAdd" in line 164 in FurnitureShoppingList.lua and remove the "local". Put the initial scan back in. No more reason to do it manually, unless you toggle the initial scan off. Fixed the lua error on startup. Sorry for that. Setting the filter to "All items" now correctly resets the filter. Line control still not broken. Fixed the quality sort header's offset being set inversely to the line template. Line controls still hiding properly! Fixed the line controls not hiding. No, really! Put some more effort into the printing of item sources from purchaseable items. I already have the achievements for some, those will be listed as well. Add-On has now a second line template! 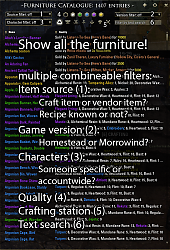 Added a database for purchaseable furniture items! Hooray - the AddOn can now tell you where to buy something! Added a filter-toggle for purchaseable/craftable items. These will be set automatically when chosing anything from the drop down menu. Took another stab at the double tooltips. Is shown with a tiny delay, but works for me now. Fixed the menu options - all but "delete character" works now. Hopefully no more double tooltips! Tooltip shows now the crafting station. After all, that's the most important thing, no? Add-on can now automatically reset the database if it's outdated. Outdated database - this should also get rid of duplicate entries. You can either file a pull-request on github, or, if you don't want to bother, fix the file, upload it somewhere and tell me where it is. Are you interested by a french translations ? ...or just file a pull request. thanks, I'll add that immediately. You're welcome to hit me up with missing data at any time, or just file a pull request. name            : "Music Box, Blood and Glory"
If not, that's fine, too! I can work around the occasional gap in FurC coverage. Last edited by ziggr : 12/01/18 at 09:37 PM. collectible items is not in the catalog right? Ah, no. I can add the Vvardenfell model on occasion, but it doesn't make much sense to add the Undaunted trophies, since they're 1:1 connected to the corresponding dungeon achievements. as far as i can tell the export function in Furniture catalog don't include the item id numbers, just names. i guess i can figure something out, maybe use the other lua file or similar. question: is it possible to make a list of itemid and names to a file? reason for asking is that id like to lookup item ids outside of the game.